The DOST-MIRDC has built another prototype vehicle for its Automated Guideway Transit (AGT) project. The vehicle is larger than the one at the University of the Philippines Diliman as each vehicle would have a capacity of 120 passengers (seated and standing). 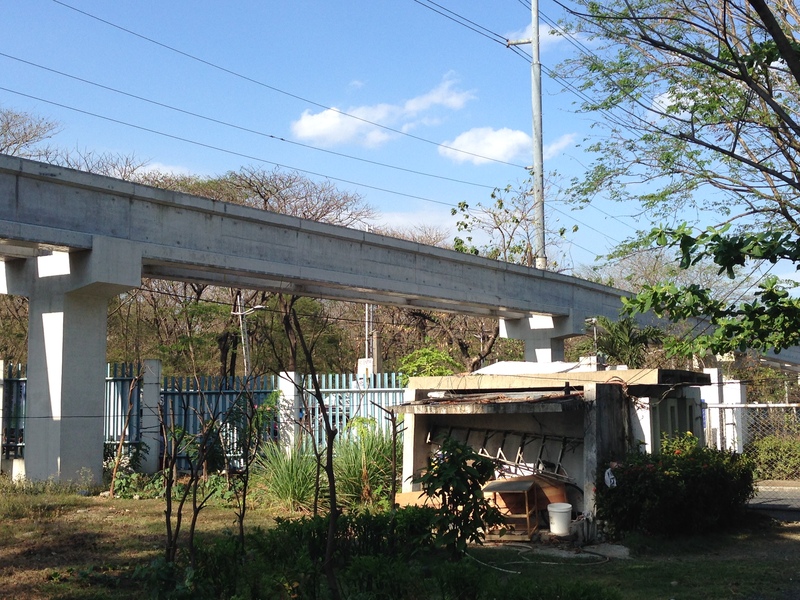 They are also building another elevated test track at the MIRDC compound across from the main DOST compound in Bicutan, Taguig City, and along Gen. Santos Avenue. This is a significant upgrade from the 30-passenger capacity vehicles at UP Diliman (60 for a 2-car train) as a 2-car train with 240 passengers means much more capacity for a real line using such vehicles. To compare, 5-minute headways along one direction could carry 720 passengers per hour for the UP Diliman prototype while the Bicutan model can carry 2,880 passengers per hour. Two prototype AGT vehicles with maximum capacity of 120 passengers at the MIRDC compound in Bicutan, Taguig City. The design is very much the same as the first prototype vehicle, with its distinctive look including the snout, headlights and skirt. The vehicle looks like it was inspired by the large provincial buses that, if seats are configured as benches and the body is stretched to be longer, can accommodate more passengers. The MIRDC is also building a test track in Bicutan within their compound and parallel to Gen. Santos Avenue. I don’t know how long this elevated test track will be but to be able to have substantial tests for the new vehicles this should be longer and would need to be extended beyond the MIRDC compound. That means the tracks would pass through land occupied by the Polytechnical University of the Philippines (PUP), which is a state university, and Camp Bagong Diwa, which is under the Philippine National Police. Can this line serve the areas along Gen. Santos Avenue? I think so but it will be competing with tricycles and jeepneys. Tricycles are the dominant public transport mode here despite Gen. Santos being a national road. Taguig City would have to find a way to address issues pertaining to a reduction or phase-out of tricycles as the communities in the area might be dependent (unfortunately) on these for their livelihood. By d0ctrine in AGT, Public Transport, Research on April 4, 2014 .